A quiet, young boy begins to visit his school library every day after classes are over. At first, he goes to just look at the colourful illustrations in the books brought to the school by smiling didis and bhaiyyas. When asked why he stays back, he replies, “This is the world I want to stay in. This makes me happy.” He slowly begins interacting with his fellow students who came to the library abd begins to make friends. The books have opened up his world; at school and beyond. The didis and bhaiyyas who stocked the library are from the NGO, Mantra4Change. The idea for Mantra4Change took shape in the minds of Khushboo Awasthi and her partner Santosh More in 2010. “Deep inside us was the strong belief that if there is anything that can change the future, it is education. When children don’t have access to quality education their life choices shrink. It was these beliefs that triggered the concept for Mantra4Change.” Khushboo elaborated. At the time, Santosh was a Teach For India (TFI) fellow while Khushboo was pursuing a Masters programme. But they both knew that they wanted to start something of their own in the development sector. It was 2013 when Khushboo and Santosh founded Mantra4Change and started working on their education project in part-time capacity. In 2014, Santosh joined Mantra4Change full-time and in 2015, Khushboo did the same. They began formally recruiting members through the TFI career portal and Azim Premji University campus recruitment process. In a span of a few years, Mantra4Change has grown from a 2 member team to a small organisation of 12 passionate individuals. Mantra4Change’s key initiative is ‘STEP’: School Transformation and Empowerment Project. Through STEP and a two-year partnership to ensure its efficacy, Mantra4Change has till date had a positive impact on over 9000 students and 350 teachers in 13 schools. Most of the schools they work with cater to underserved children in the not-so-popular narrow alleys of urban and peri-urban Bengaluru. To effectively implement STEP, the organisation first contacts the head of the school and then works down from there, connecting with each part of the school team on a personal level to understand their needs and challenges. In one of the schools, teachers in the primary school mentioned the need for better books for children to read. 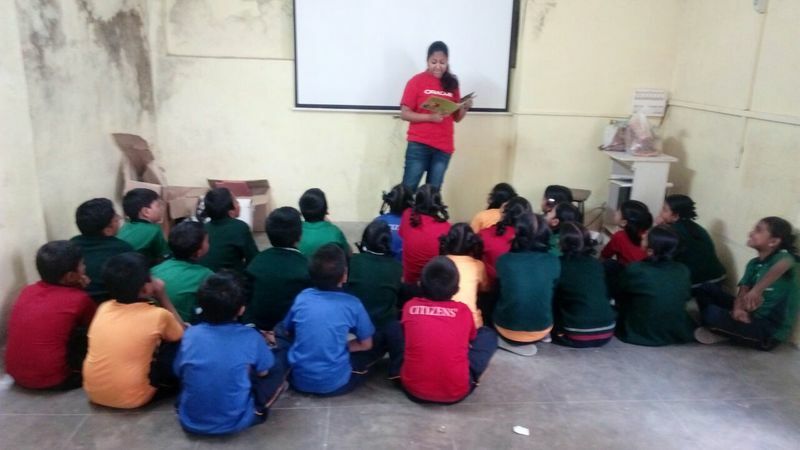 Mantra4Change reached out to Pratham Books and helped acquire Library in a Classroom kits. This kind of rapport building, ensures that within 4-6 months 70% of staff are onboard with the programme. Khushboo and her team believe that students must be empowered and encouraged to step out of their comfort zone. She shared a story of how 12 students from Mantra4Change partner schools attended an International Geography Youth Summit. “We had to convince the teachers that the children were indeed ready to take the stage. At the conference, to the surprise and delight of the children, two of their groups got standing ovations from the audience. When they came back, you could see the confidence in them. They came up to the team and their teachers, and said, ‘thank you so much, ma’am, for giving us this opportunity. We would never have experienced this.’ We saw an an opportunity and took it to our students and they grabbed onto it. It’s their hard work at the end of the day.” remembers Khushboo. Under STEP, Mantra4Change is also implementing a library programme in which they set up libraries to make books more accessible to children. Mantra4Change has teamed up with Pratham Books to provide the children colourfully illustrated, multilingual stories. Describing the books and the library programme, one student told us, “The illustrations are very nice, the story is funny!” adding that she had begun reading at home more after the library had been set up. “The whole atmosphere in the library when the children come is magical! Even those who can’t read fluently yet like to come and touch the books, see the pictures and make up their own stories using their imagination. It’s beautiful to see.” Khushboo added. Mantra4Change’s passionate team is determined to make a difference in the lives and learning of the children in the schools they work with “Our team is here because they really want to make a change and affect education at the school level.” Mantra4Change hopes to double the number of schools they work with as well as the team’s size by May 2017. We’re sure they’ll get there, one step at a time!